British Cycling & BCDS welcomes all young people who are looking to build their leadership and communication skills in a practical environment. You can develop these skills whilst contributing to the development of one of the most successful Olympic sports in recent years! 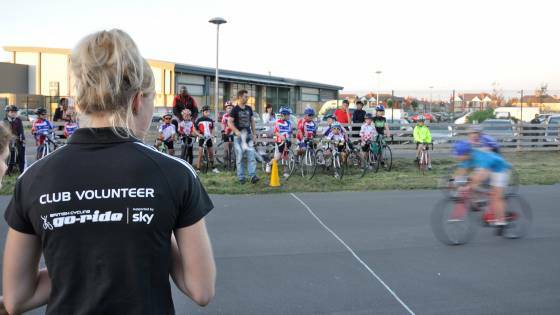 A fantastic place to start volunteering within cycling is through the Cycling Award for Young Volunteers (CAYV) programme. This combines an introductory workshop, which covers the fundamentals of cycle sport and volunteering roles, with practical placements within BCDS. You can work towards a bronze (12 hours), silver (24 hours) or gold (36 hours) award with free branded volunteer clothing, certificates, memberships and even an invitation to the be awarded in front of all club volunteers at our annual Go-Ride Conferences. Coaching is at the heart of cycling performance at every level from teaching basic bike handling skills in a school or club through to training athletes for the Olympic Games or Tour de France. After completing the CAYV workshop you can start to get involved by shadowing a British Cycling qualified coach within a Go-Ride club or at one of our Holiday Coaching Programmes. In addition, depending on your age, you may wish to become a qualified coach yourself. For more information about British Cycling's coaching awards, including the discipline-specific awards, please see the Coaching section of our website. There are thousands of cycling events every year and they all rely on officials to ensure that they are safe, fair and most importantly fun! The CAYV demonstrates a broad overview of the roles required for a cycling event. The best way to get involved following the CAYV workshop is through Go-Ride Racing. For those of you intrigued by the workings of a Go-Ride club, its activities and all of its different volunteers then club management may be the option for you. The CAYV provides an insight into the varying roles required for a club to function effectively and we can set you up within a local club to explore the opportunities. You could become a youth representative by outlining the views of the younger club members to committee members and even attending regional or national forums with other young club representatives. Racemakers builds on the knowledge gained through the Cycling Award for Young Volunteers and encourages more young volunteers to get involved in cycle sport. This is the first step into event volunteering for 14-18 year olds and may lead to further officiating courses to create support opportunities at national and international events. Racemakers has been granted the prestigious London 2012 Inspire mark, the badge of the London 2012 Inspire programme which recognises exceptional and innovative projects inspired by the 2012 Olympic and Paralympic Games. The programme combines a practical workshop with volunteering at a local club in preparation for planning and delivering supervised entry level bike races in school and community settings. For more information have a look at the programme flyer by clicking the link below or if you would like to join the programme contact Kelly using the details above. On the completion of the CAYV programme our young volunteers are offered the opportunity to take their volunteering to the next step by becoming young leaders and working towards their Platinum Award. The National Youth Forum has recently been set up by British Cycling to empower young people and enable them to actively help us to develop opportunities for their peers, providing the chance to ride, race and volunteer beyond 16. The National Youth Forum will be made up of 8-12 young volunteers from across the country, who are 16+ and currently working towards their Gold or Platinum Award on the CAYV Programme. The group will meet on a quarterly basis to discuss how we can continue to engage with young people and encourage them to participate in our fantastic sport. Young volunteers are the future of our sport and we are keen to use their experiences, opions and ideas to help develop our programmes going forward. If this is something that you or the young volunteers within your club may be interested in you can download an application form.